Repeat purchase. Best price compared to Health Food Stores. 6N Dark Blonde by Naturtint is a great product also like that is made without animal testing/cruelty free and no ammonia. 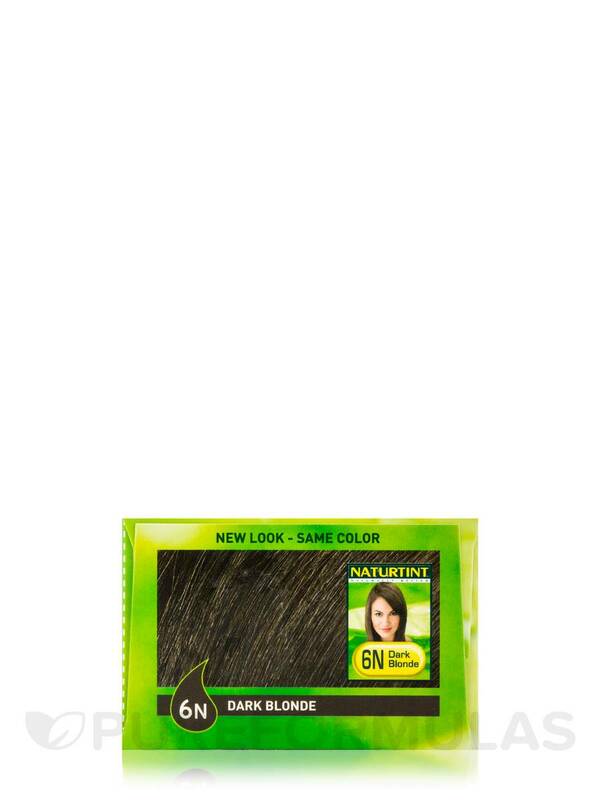 I thought that I would give 6N Dark Blond Naturtint a try and glad I did it The color lasts much longer than the other brands that I bought from the stores and it doesn't have the harsh chemicals they do. 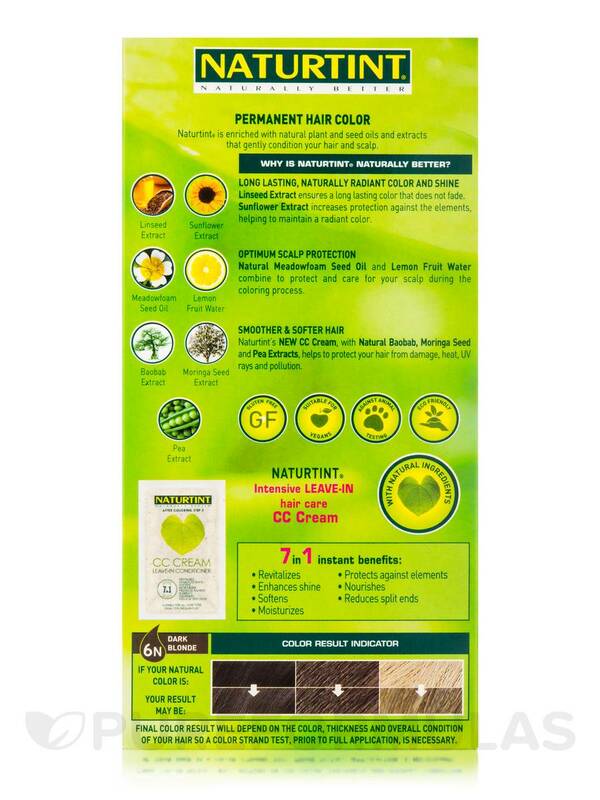 Phergal Laboratorios has integrated the latest technology in hair to create NATURTINT® GREEN TECHNOLOGIES‚ the first 100% permanent hair colour WITHOUT AMMONIA formulated with active vegetable ingredients. Discover anew concept in hair coloration that give you healthy and revitalized hair. 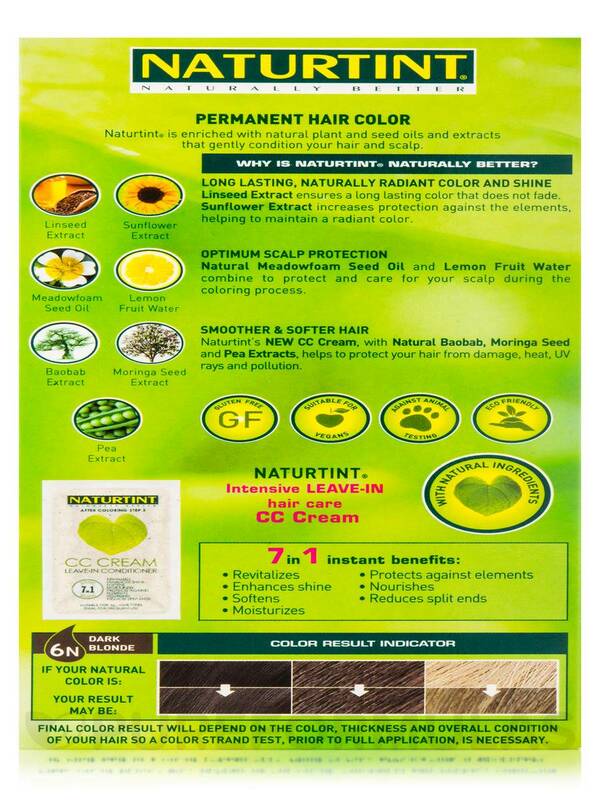 Discover NATURTINT® GREEN TECHNOLOGIES‚ THE FIRST 100% permanent hair colorant without ammonia formulated with active vegetable ingredients. A unique and perfect union of colour and care. Naturtint: 60 ml/2 fl.oz.-PEG-2 oleamine‚ aqua (water)‚ cocamide dea‚ alcohol denat (alcohol)‚ propylene glycol‚ ethanolamine‚ oleic acid‚ sodium sulfite‚ hydrolyzed vegetable protein (triticum vulgare‚ soy‚ corn‚ avena sativa)‚ sodium ascorbate‚ tetrasodium EDTA‚ parfum (fragrance)‚ p-phenylenediamine‚ 4-chlororesorcinol‚ 2-amino-4-hydroxyethylaminoanisole sulfate‚ N‚N‚ bis (hydroxyethyl)-p-phenylenediamine sulfate‚ m-aminophenol‚ 2-mthylresorcinol. 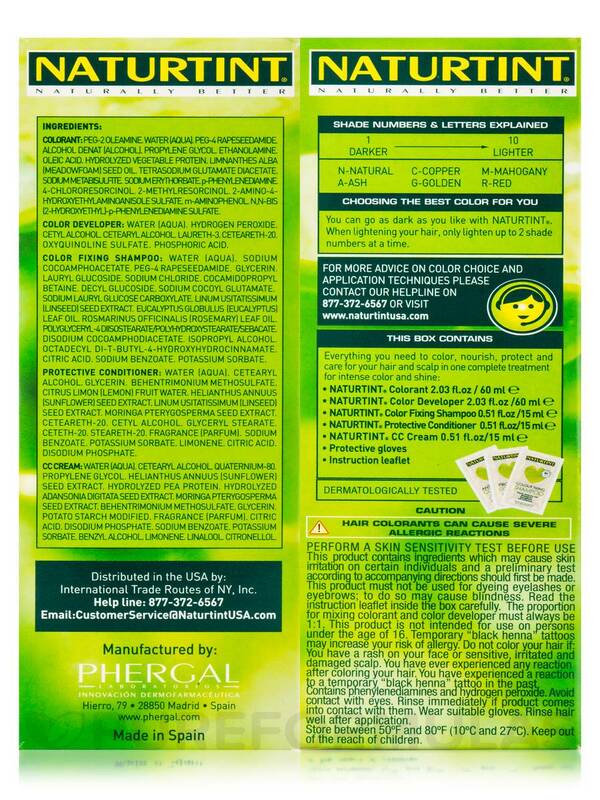 Color developer: 60 ml/2 fl.oz.-Aqua (water)‚ hydrogen peroxide‚ cetearyl alcohol‚ laureth-3‚ ceteareth-20‚ cetyl alcohol‚ oxyquinoline sulfate. Hair Conditioner: 15 ml/0.5 fl.oz.-Aqua (water)‚ quaternium-83‚ rosmarinus officinalis (rosemary oil)‚ eucalyptus globulus (eucalyptus globulus oil)‚ imidazolidinyl urea. Excellent product! 6N Dark Blond by Naturtint covers gray hairs very well; all natural; I have no allergic reaction; great value. 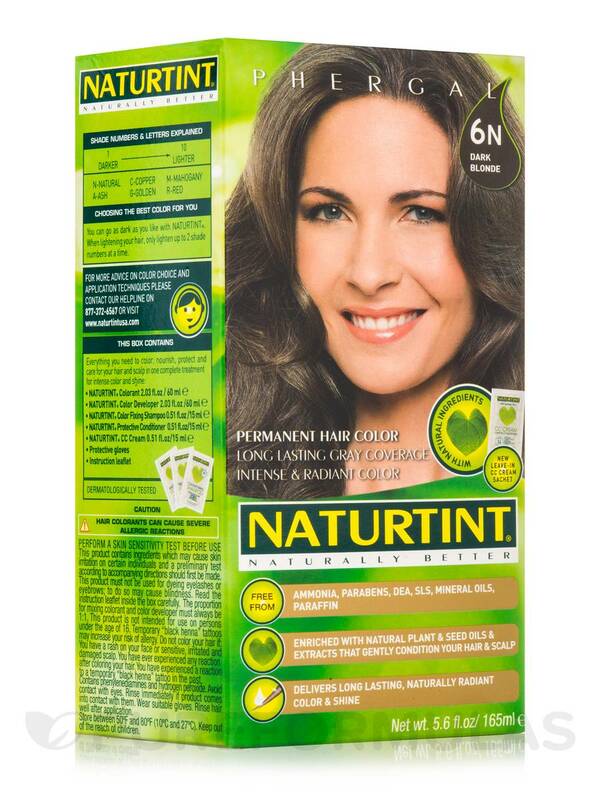 This 6N Dark Blonde by Naturtint is good. It left my hair dry and shapeless though. It leaves my hair dry and shapeless. My natural waves are gone. 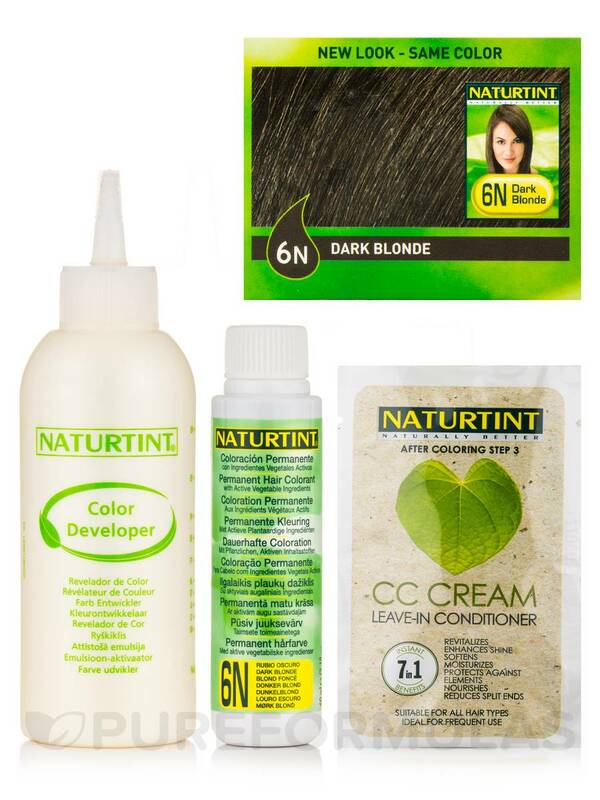 I tried 6N Dark Blonder by Naturtine for the first time about 15 years ago and I didn't like it because it made my hair feel like straw. I tried it again less than a year ago and I have been using it ever since. I'm guessing they may have changed their formula? Whatever it is, I like it now. The appeal that made me try it again is that it is a plant-based hair color without a bunch of stuff I don't want on my hair or skin: ammonia, sodium laureth sulfate, parabens, mineral oils, etc. I also love that it is a 'kit'; I don't need to buy developer, gloves or special shampoo/conditioner because it all comes together! One of the main positives is that the color holds and doesn't seem to fade. Buying it on PureFormulas.com is one of the smartest things to do (when you can find it in stock anyway). Color holds, price, convenience of the 'kit', and doesn't dry out my hair/skin. Great Product ,and Great Price. 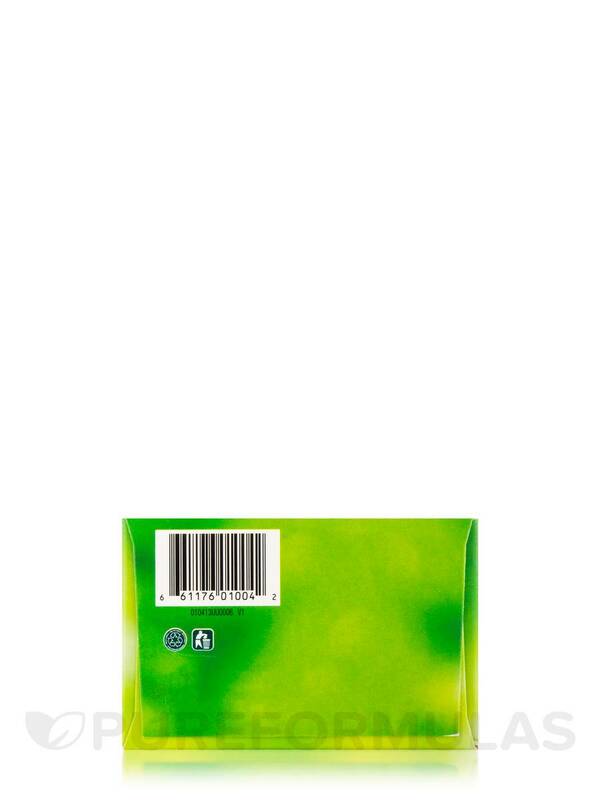 Terrific product re color and ease of use also terrific price. no animal testing/cruelty free. No ammonia. No animal testing a big pls! 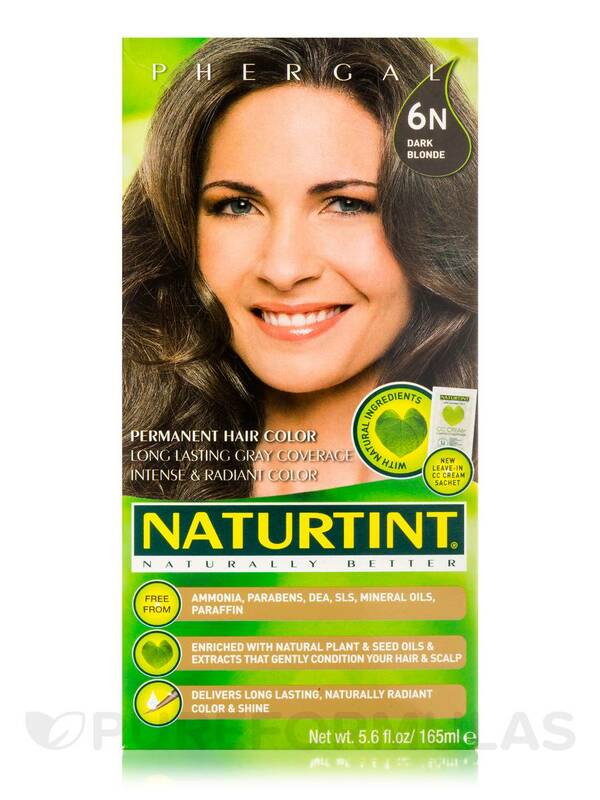 Very happy to have found 6N Dark Blonde by Naturtint at PureFormulas. I sound like a broken record but I have purchased 6N Dark Blonde at local health food stores for several years and paid a lot more. Also no animal testing is always a big plus for me when making buying decisions. 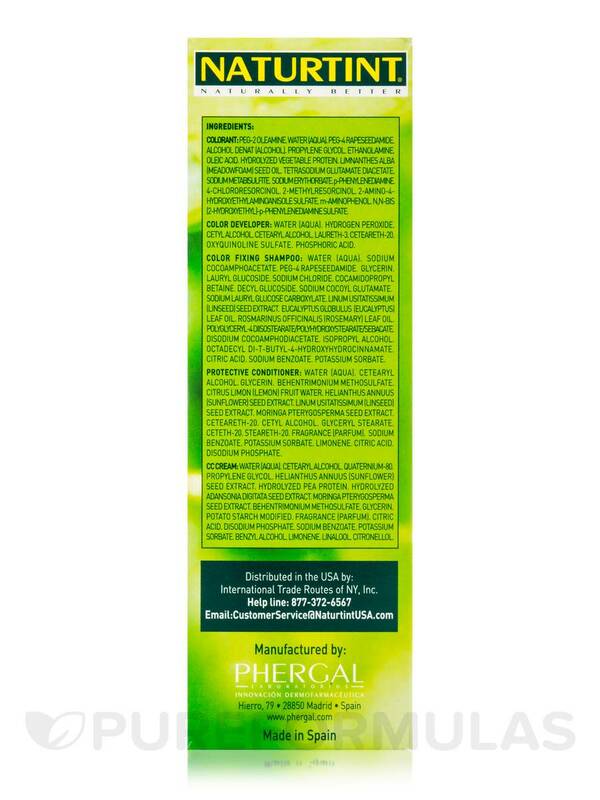 Great product, great price, gentle on hair and no animal testing. No dislikes for this product. Its ok, not loving this one. 6N Dark Blonde by Naturtint colors my hair to a darker color then what is shown on the box, then after about a month my hair turns yellowish blond. My natural hair color is dark brown with auburn highlights and that is exactly what I got when I used this. I have a lot of gray and it covered it great. 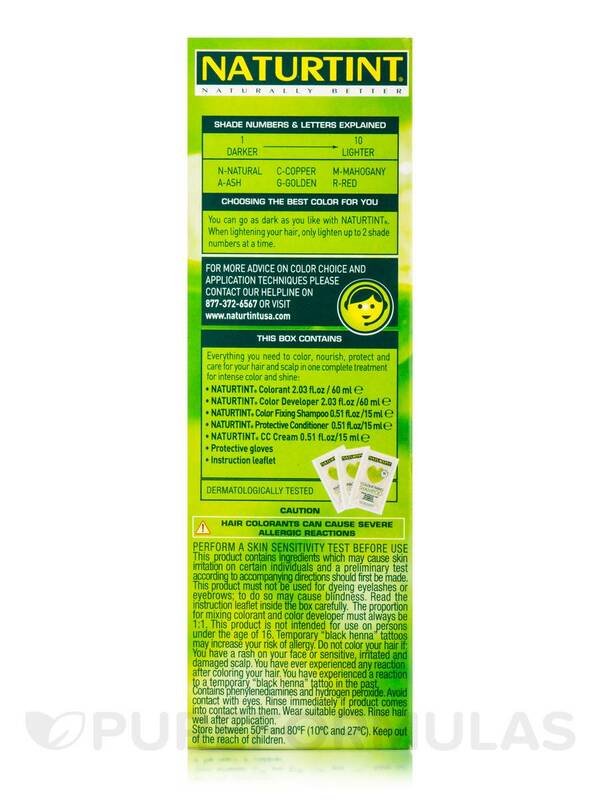 It had no bad odor did not irritate my head like the over the counter ones do. Left my hair in great condition like it was before I started using the over the counter dyes. 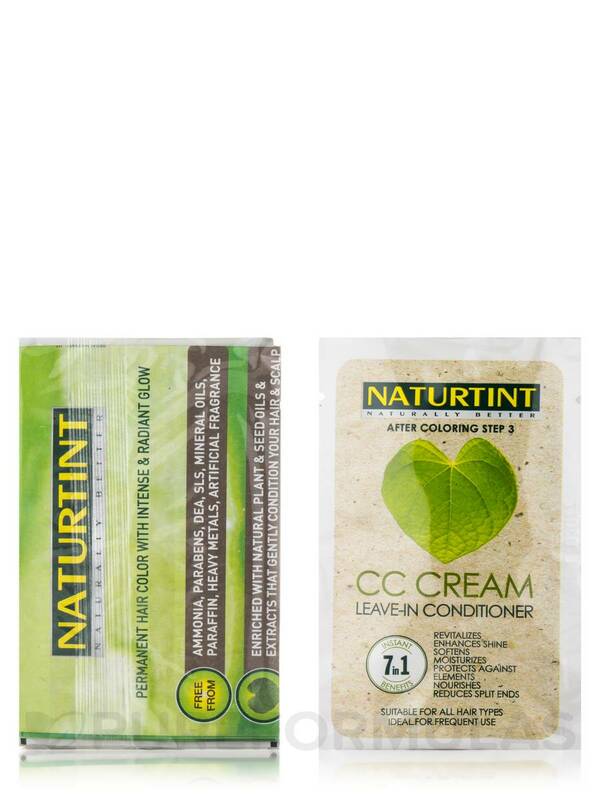 After using Naturtint I will not ever use anything else on my hair. I will be a returning customer from now on. really impressed with this product. This is the first product I have used that actually completely covers my gray! That color fades slightly with each shampoo but not as much as when I was having it done professionally and the color seems more natural too. I am sticking with this product. I like the fact that it is natural.